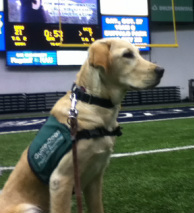 she will be a D4D Ambassador and the founders personal alert dog. graduated in July of 2011 and was raised by Monica and Laureen. He and his teenage partner live in Texas. We stay in touch with them on Facebook! Susan of Flagstaff, with Alvin, a black Labrador retriever guide dog by her side, graduated on january 10, 2009 from a month of intensive training at Guide Dogs for the Blind in Boiring, Ore. 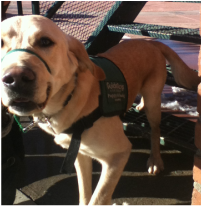 Honor was a regular attendee, with Jeanne, at many eastside Flagstaff Athletic Club classes and folk dancing sessions. 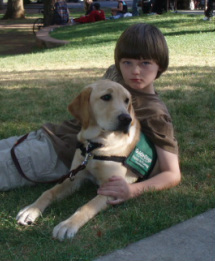 He graduated as a Guide Dog on november 11, 2006. Jeanne and Don were proud of their graduate. On Sept. 3 2005 in San Rafael, Calif., they watched proudly as Charys, a yellow Labrador retriever graduated from Guide Dogs for the Blind training. After the ceremony Jeanne presented Charys, to his new owner, Robert "Buster" Brown.